Delicious jams and jellies. Handmade in small-batches in the Cowichan Valley on Vancouver Island. Teaching the kids at the Duncan Christian School all about Jam! Mrs Jones Jams is a range of natural jams and preserves, all handmade in small batches by Joan Wikkerink and her husband Brad Jacobsen and family. Using the traditional open kettle method and as many local products as possible, prepare yourself to taste the finest the beautiful Cowichan Valley on Vancouver Island, B.C. has to offer! 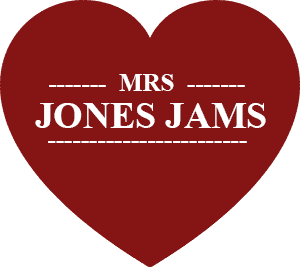 Mrs Jones Jams was originally founded by Rebecca Jones, hence the name “Mrs Jones Jams”. Rebecca and the “new” team, Joan & Brad, believe that truly delicious preserves can only be made with the finest ingredients. Living in the Cowichan Valley, “God’s country”, where there is an abundance of wild and cultivated berries, apples, rhubarb, pears and unpasteurized honey, Joan and her family pick and preserve the fruits at their peak allowing you to enjoy the jams throughout the year! The savory jellies are made using local peppers, often grown in their own greenhouse, are tangy and flavourful to complement your meats and cheeses. If you are accustomed to mass-produced, supermarket jams and preserves then you are in for a real treat when you taste the amazing full flavour of these high quality, small-batch products. Mrs Jones personally guarantees the quality of all her products. If for any reason you are dissatisfied, please contact us here.